We’d love your help. Let us know what’s wrong with this preview of The White Plague by Jean Dubos. 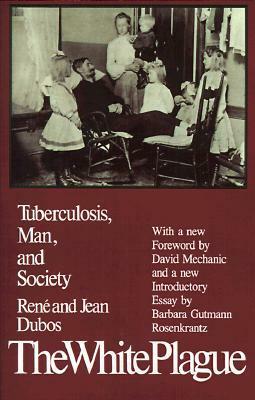 In The White Plague, René and Jean Dubos argue that the great increase of tuberculosis was intimately connected with the rise of an industrial, urbanized society and—a much more controversial idea when this book first appeared forty years ago—that the progress of medical science had very little to do with the marked decline in tuberculosis in the twentieth century. The Whit In The White Plague, René and Jean Dubos argue that the great increase of tuberculosis was intimately connected with the rise of an industrial, urbanized society and—a much more controversial idea when this book first appeared forty years ago—that the progress of medical science had very little to do with the marked decline in tuberculosis in the twentieth century. To ask other readers questions about The White Plague, please sign up. "What properties do tubercle bacilli possess that permit them to establish themselves, multiply, and do damage in the human body? In other words, what is the mechanism of tuberculous disease? There is still a lot of interesting reading about what happens in the disease and what various physicians and researchers did to study it and fight it and the social history of the disease. This includes a social history of public response to the disease. For example, during the 1700s laws attempting to prevent contagion were passed in Italy and Spain, and for a while Naples required the public authorities to replaster the interior of the house and burn wooden shutters and doors in the dwelling of anyone diagnosed with TB. In America, a number of societies dedicated to public education about TB facts and prevention sprang up in the late 19th century and early 20th century, with publicity techniques including infographics and jars of tuberculous lungs preserved in formaldehyde. It's been years since I read this book but it was fascinating. I read it during the time of the great AIDS epidemic to better understand how American culture copes with catastrophic disease, and what role disease and epidemics play in forming culture. It was all that, and entertaining as well. A good thing to read if you want to understand our current concerns about healthcare. Important early work in infectious disease epidemiology and human ecology. Reminds us that tuberculosis was once far more threatening to western Europe than HIV-AIDS is today to that part of the world. Rene Dubos was a microbiologist and philosopher. In my opinion this is the _original_ authority on TB as a disease and it's relationship to society.